Luxury European bed linens. Vintage and modern styles. 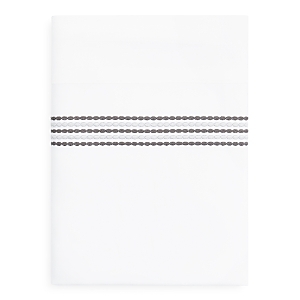 Woven of soft, 400-thread-count Pima cotton sateen. Optional monogramming available. 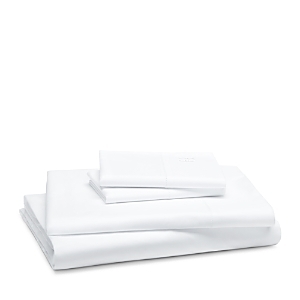 406-thread-count sheets of Italian-spun Egyptian-cotton percale have a chamois-like softness. Flat sheet and pillowcases have a hemstitch border and two lines of decorative embroidery Optional monogramming available. 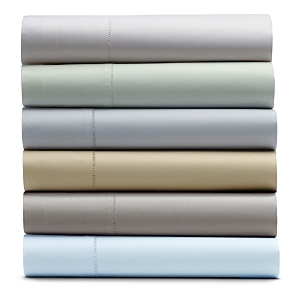 Sheets are woven of soft, 400-thread-count Pima cotton sateen that has a satin-like softness, sheen, and drape. They're finished with an embroidered satin-stitch hem. Optional monogramming available. Sheets are woven of soft, 400-count Pima cotton sateen with a satin-like softness, sheen, and drape and finished with an embroidered satin-stitch hem. 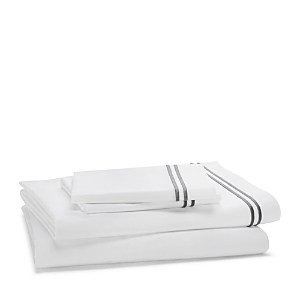 Machine wash. 500-thread-count Egyptian cotton percale. Detailed with Sferra's signature "punta ombre" hem. 1,020-thread-count sheets woven in Italy have cable lace insets. 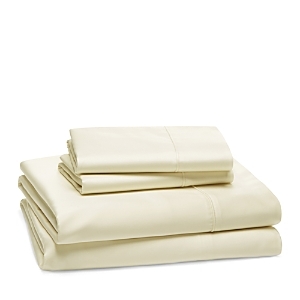 The Egyptian-cotton sateen fabric has a satin-like softness, sheen, and drape. Machine wash. Made in Italy. Treat yourself to 1,020-thread-count sheets woven in Italy. 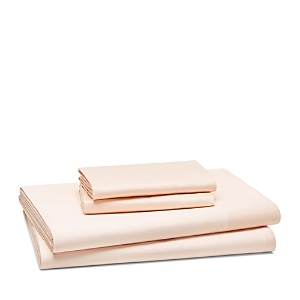 The Egyptian-cotton sateen fabric has a satin-like softness, sheen, and drape. Flat sheets and pillowcases have hemstitch detail. 406-thread-count white percale proves to be the ideal backdrop for Plumes needlework — one of the most beautiful embroideries we've ever seen. 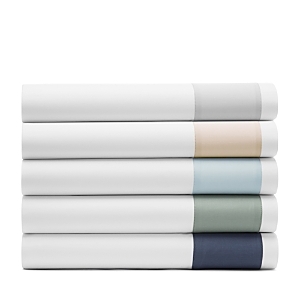 Percale has a smooth, crisp feel and matte look. Machine wash. Made in Italy of Egyptian cotton woven in Italy. Optional monogramming available. Sheets are woven of soft, 400-thread-count Pima cotton sateen and finished with an embroidered satin-stitch hem. Machine wash. Detailed with a simple, classic hemstitch, the Fiona sheeting collection is crafted from soft Egyptian cotton sateen in a range of rich, neutral colors. 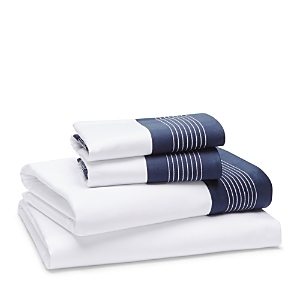 400-thread-count pima cotton sheet set with cane embroidery. SFERRA's Grande Hotel sheeting collection features a double row of tailored satin stitching along the border of the flat sheet, duvet cover and shams, crafted in soft and indulgent Egyptian cotton percale. 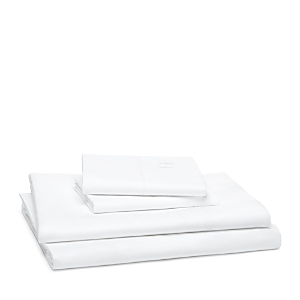 Sheet set made of cotton sateen. Made in Portugal. 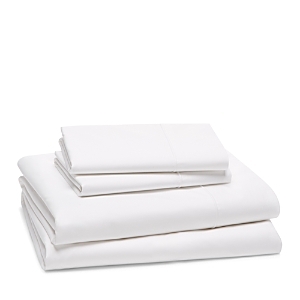 Sheet set made of cotton sateen. Made in Portugal. Sheet set with contrast picot trim. 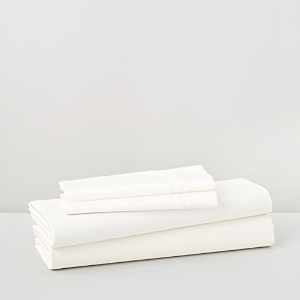 Cotton percale. Made in Portugal. 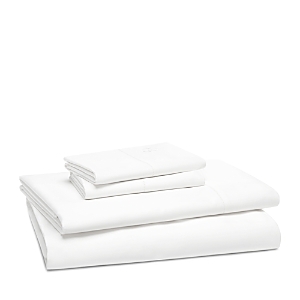 Lustrous and silky, 500-thread-count, Egyptian-cotton sateen. Machine wash. Made in Italy. 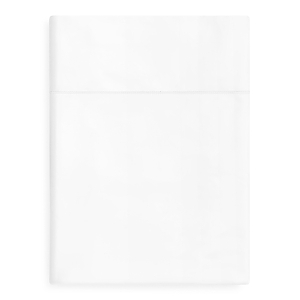 Smooth, crisp Egyptian-cotton percale with hemstitch detail. 500-thread-count. Machine wash. Made in Italy. Add a crisp new look to your bedroom with the Signature sheet set from Martha Stewart Collection, featuring a soft-to-the-touch cotton sateen fabric that is breathable and easy to care for. Create a fresh look in your room with the Signature Scallop sheet sets from Martha Stewart Collection, featuring a crisp cotton fabric and decorative trim for added style. Add a crisp new look to your bedroom with the Signature sheet set from Martha Stewart Collection, featuring a soft-to-the-touch cotton sateen fabric that is breathable and easy to care for. 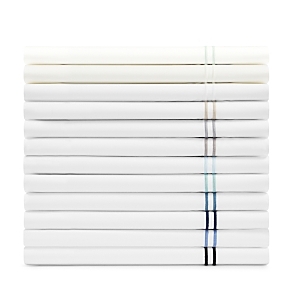 Timeless style and incredible comfort make the Whim by Martha Stewart Fringe Sheet set a must have for any bedroom. 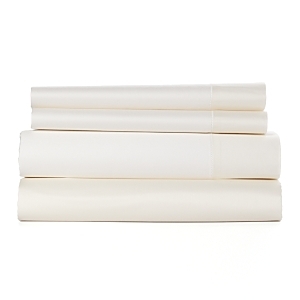 Create a charming look for your room with Martha Stewart’s Organic Cotton sheet set. The Jaynie sheet set is designed with a Laura Ashley signature cottage floral print mixed with a classic blue and white ticking stripe. 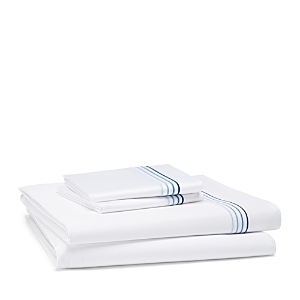 In a cheerful palette of blues and aqua on a crisp white cotton ground is a sheet set one cannot resist. A cottage floral print on the flat sheet is paired perfectly with a classic blue and white ticking stripe fitted sheet for that customer looking for a fresh new look. Two of the pillowcases are constructed with the dainty cottage floral pattern while the other two pillowcases are made from the same ticking stripe pattern found in the fitted sheet, allowing you to mix and match to suit your style. The Sugar Almond Floral sheet set is designed with a combination of pastel hues, including peach, pale yellow and grey on a white ground. The allover meadow floral print on the flat sheet has a peaceful appearance that is complemented by a graphic mini dot on the fitted sheet. Two of the pillowcases are made of the meadow floral print while giving you the ability to mix or match with another two pillowcases of the graphic mini dot pattern. Grace notes for your bed: lace-edged Annabelle flat sheets and decorative pillowcases made of beautiful creamy linen. 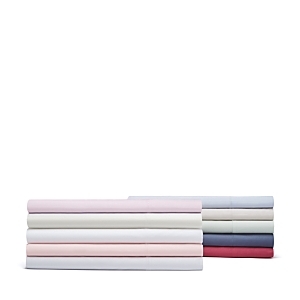 300-thread count Tencel® lyocell/cotton. Garment washed. With the smooth feel of silk and the easy care of cotton, Home Treasures' Athens collection is crafted from 100% modal. 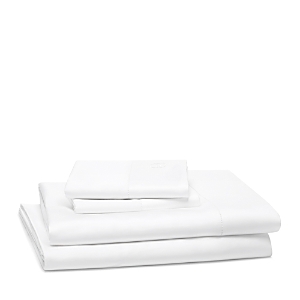 Best of all, you'll find these sheets get softer and more wrinkle-free with every wash. 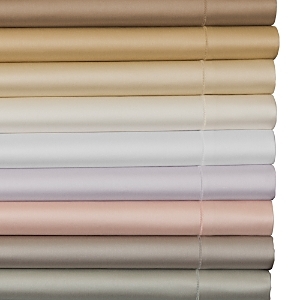 Smooth, sumptuous and simply superb, Home Treasures' Princess sheets, crafted in 600-thread count, Egyptian cotton in an Italian sateen weave, are finished with a simple yet sophisticated hemstitch. Inspired by the twinkling stars of the midnight sky, the five lines of Stella embroidery in alternating classic colors grace Home Treasures' 600-thread count, Egyptian cotton in an Italian sateen weave creating sheets with a contemporary, fresh look. Made from a lavish silk and cotton blend in a sateen weave, our Cotton Silk collection feels exquisitely soft, drapes beautifully and boasts an understated matte-sheen. Not only does silk have temperature regulating benefits that keep you cool in Summer and warm in Fall, it is also renowned for its ability to help hair and skin retain their moisture and can even help prevent wrinkles, making this the perfect bed linen for a beautiful night's sleep. Our Cotton Silk collection is a Sateen weave of Giza Egyptian Cotton and Mulberry Silk, a unique blend creating a super soft touch and luxury feel with a beautiful matte-sheen finish. Inspired by a small seaside village in the north of Portugal named Miramar, where the sea and sand meet in perfect harmony, this collection showcases expert craftsmanship, a magnificent blend of luxury fibers and the finest cotton. Cozy and exquisitely smooth, these bed linen are the ultimate luxury for a perfect night's sleep. Our 420-thread count Sateen brings the ultimate luxury look and superior comfort to any bedroom. Made from 100% certified Giza Egyptian Cotton this sateen collection will always remain beautifully soft, silky and smooth. Indulge in a truly incredible sleep experience with one of the finest bed linen fabrics in the world. Sateen is created using a fine satin weave, providing an exquisitely smooth finish with a soft and silky touch. Our 420TC Sateen collection is Egyptian Cotton Gold Seal Certified, ensuring only the best materials were used to create this product. These latest forever pieces by Frette work in harmony to help you build the perfect bed. 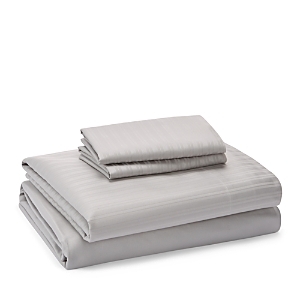 Enjoy the soft luxury of 300-thread count sateen for a wonderful night's rest. 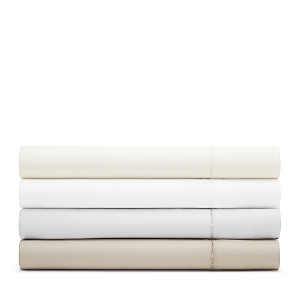 Created for the world's top hotels, this elegant and luxurious Egyptian cotton percale bedding collection by Frette features a contrasting double row of embroidery along the border of the duvet, shams, flat sheets and pillowcases. Embellished with double rows of ajour pulled-thread embroidery, this sublimely refined sheet sheet seamlessly blends with a range of decors and styles. 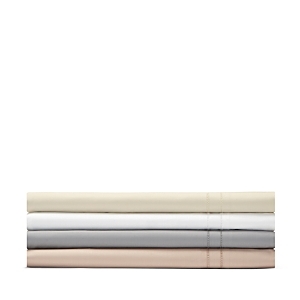 Crafted in Italy from luxuriously smooth, 300-thread count cotton sateen jacquard, these sheets by Frette feature a classic tonal double stripe pattern on the flat sheet and pillowcases. Embellished with ajour pulled-thread embroidery, this sublimely refined bedding seamlessly blends with a range of decors and styles. 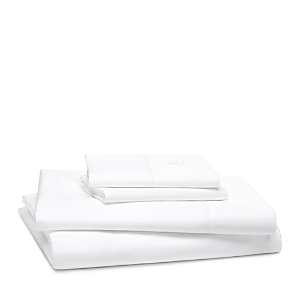 Classically elegant, this solid sheet set by Frette is crafted in luxurious, 600-thread count cotton sateen and finished with a shadow stitch on the cuff of the flat sheet and pillowcases. Classically elegant, this bedding collection by Frette is crafted in crisp, luxurious 400-thread count cotton percale and finished with a shadow stitch border. Crafted in sumptuous cotton sateen, the Hotel Porto collection by Frette boasts a striking aesthetic in elegant, solid shades with an embroidered stripe border. Inspired by a fresh summer day by the Mediterranean Sea, Frette Hotel Cruise brings a nautical look with a border created from four rows of embroidery in gradient hues. 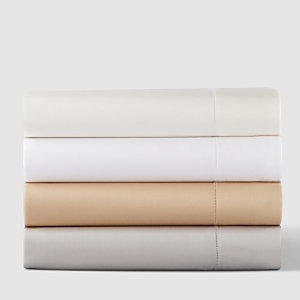 Crafted in luxuriously smooth, 300-thread count cotton sateen. Thread count is a measure of the threads per inch used to weave the fabric. The higher the T/C, the softer and silkier the touch. 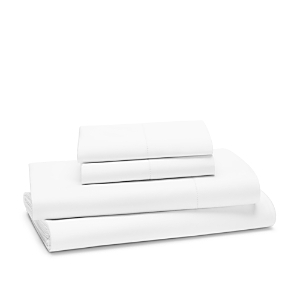 Egyptian cotton has a longer loop which makes it softer and more comfortable. Fabrics made in the US with longer loops are called Pima Cotton.